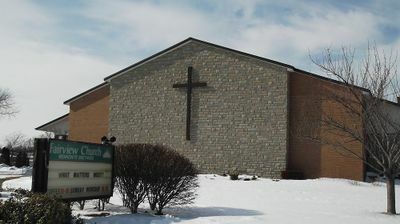 The Fairview Community Church in St. Catharines, Ontario began as the Fairview Mennonite Brethren Church, an outgrowth of the Scott Street Mennonite Brethren Church as an English-speaking congregation. The congregation was officially organized in 1963 with 156 charter members under the leadership of Wally Unger. A meeting house was completed in 1964 and a parsonage was completed in 1965. Harvey Gossen became the first pastor in 1964 and he initiated outreach ministries such as Dial-a-Meditation, outdoor services at Fairview Mall in 1966, devotions on CKTB radio station in 1969, Vacation Bible School for boys and girls, and Boys Brigade and Pioneer Girls. With an increase in members and programs, a gymnasium and other facilities were added in 1968. From 1978 to 1987, the congregation also operated a Nursery School. In 1980, they were partners in starting another congregation in the area, Fairview-Louth. In 1981 “Time out” a ladies fellowship was launched which drew in ladies from beyond the regular Sunday attendees. A Sunday school for all ages was offered and reached a record attendance of 500 in 1973. Dozens of young people were baptized over the years with a record of 30 baptized in 1979. The membership of Fairview MB Church in 1980 was 425. In 2000, the membership stood at 290. In 2016, the recorded membership was 185. And, in 2017, the congregation changed its name to Fairview Community Church. In 2018 the congregation decided to close. A final worship service was held on 30 September 2018 with former pastor Waldo Pauls delivering the message based on Isaiah 66.1-2. In late spring-early summer 2018, the Mennonite Brethren denomination reached out to Mike and Terrie Sherbino asking them to consider moving to St. Catharines to open a new church. Under their leadership, a new church, that would meet in the same location, called Northend Church, was formed. Canadian Mennonite (5 May 1964): 3. Fairview Community Church. "Final Service bulletin" (30 September 2018). Friesen, Ron. "A decade of growth at Fairview Church." Mennonite Brethren Herald 13, no. 6 (22 March 1974): 12. Mennonite Brethren Herald (27 May 1988): 50; (12 May 1989): 21; (10 June 2005); (23 September 2005). Unger, Walter. "Fairview M.B. Church." Mennonite Brethren Herald 3, no. 35 (4 September 1964): 9. When Your Children Shall Ask: A History of the Ontario Conference of Mennonite Brethren Churches, 1957-1982 (1982): 62-64. Centre for Mennonite Brethren Studies, Winnipeg, MB: http://cmbs.mennonitebrethren.ca/inst_records/fairview-mennonite-brethren-church-st-catharines-on/. Thiessen, Richard D., Sam Steiner and Alf Redekopp. "Fairview Community Church (St. Catharines, Ontario, Canada)." Global Anabaptist Mennonite Encyclopedia Online. November 2018. Web. 22 Apr 2019. http://gameo.org/index.php?title=Fairview_Community_Church_(St._Catharines,_Ontario,_Canada)&oldid=163671. Thiessen, Richard D., Sam Steiner and Alf Redekopp. (November 2018). Fairview Community Church (St. Catharines, Ontario, Canada). Global Anabaptist Mennonite Encyclopedia Online. Retrieved 22 April 2019, from http://gameo.org/index.php?title=Fairview_Community_Church_(St._Catharines,_Ontario,_Canada)&oldid=163671. This page was last modified on 21 March 2019, at 21:08.